Last week, after my mom and I visited the pond with the salamanders, we stopped by a little creek that was just around the corner. 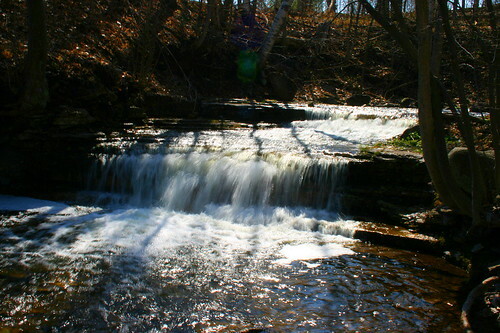 It’s Silver Creek, which is one of the primary tributaries of the Credit River, which itself runs into Lake Ontario. Silver Creek joins the Credit just south of Georgetown, a small town west of Toronto, not far from where my parents live. It runs north through Georgetown, passing the little hamlet of Ballinifad, to its headwaters… or I suppose it’s the other way around, running south from the headwaters, to join the Credit. Either way, it’s one of the primary creeks in my parents’ “neighbourhood”. The Credit River was one of the rivers that was part of an Atlantic Salmon reintroduction program launched in 2006 due to the quality of its water. The salmon can occasionally be seen migrating up its Silver Creek tributary, and there are signs in areas where the creek passes under roads or through parks indicating that it’s a salmon-spawning creek. It’s a good creek for salmon, with the sort of stony bottoms that create many nooks and crannies for spawning. The same characters that make it good for salmon make it good for other aquatic invertebrates and fish. 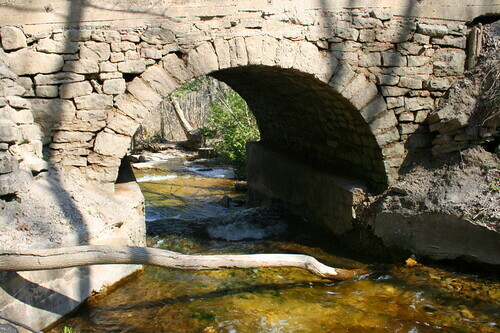 We stopped at this beautiful stone bridge and hiked down to the water’s edge. The water comes over the waterfall above and then slows down (a little) in this broader area just before the bridge. The slower water allows creatures to move around between and under the stones where in the faster currents they would be swept away. It also allowed us to step in to the water without being knocked over or our boots filling with water. Or my mom’s boots, anyway – I stood on the bank. Mom waded in and started turning over stones while I held the net a short ways downstream. It didn’t look like we’d caught anything at first, but as I pulled the net out of the water I could see something large moving amongst the debris. We put some water in a tub and dumped the net contents in. To our surprise, there was a lot more than we initially thought. The large moving thing turned out to be this giant crayfish… in fact, all the moving things were crayfish, of varying sizes. The biggest one was dark, and very big. I can’t believe I didn’t see it go into the net when Mom turned over the stone. Mom decided she didn’t really want to lift up any more rocks. In contrast, the little guys were quite little, perhaps only 1.5cm (less than 3/4″). There are about 500 species of crayfish in the world, about 350 of which occur in North America, where they’re also called crawfish or crawdad. I had no idea there were so many species of them. The largest is found in Tasmania and may grow up to 40cm (15.5″), the smallest is in the southeastern US and only reaches 2.5cm (1″). On average, most species grow to about 7-8cm (2.5-3″), sometimes reaching 12cm. Our big one was definitely one of the larger guys. So I don’t know if what I had in the tub were different species or just different life stages. 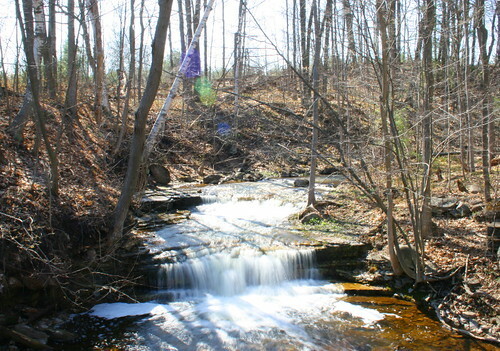 McMaster University lists 9 species occurring in Ontario, of which 6 are stream-dwellers. Many species will reach sexual maturity and mate the fall after they hatch, though fertilization (the female holds the sperm internally over the winter) and egg-laying usually occur in the spring. The female carries the eggs attached to her belly until they hatch 2-20 weeks later (what a time span! I assume that to be a range across species, although water temperature is also a factor). The young stay on the female till after their second moult. 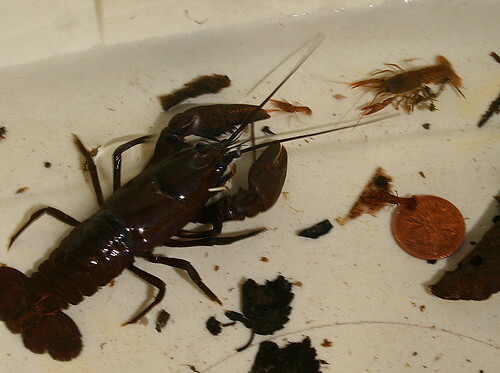 A crayfish lives on average about two years. 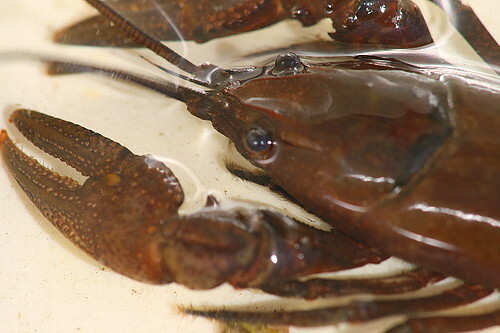 Crayfish are crustaceans, closely related to lobsters, and are in fact eaten in much of the world. In the US, they’re mostly found on plates in the southeast, prepared similarly to the lobster. 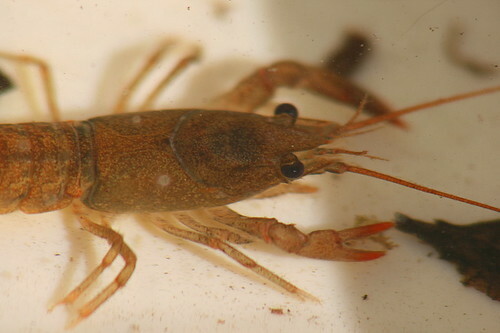 Wikipedia makes the interesting observation, “Notably, in Canada the crawdad is considered interchangeable with the potato.” You know… this one seems to have slipped my observation. I use potatoes. They’re also occasionally found as pets in aquariums. 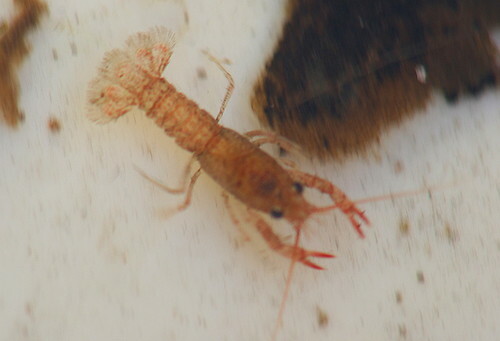 They’re easy to keep, feeding on shrimp pellets, tropical fish food, algae wafers, or other easy sources. They’re also not opposed to taking small fish if the opportunity arises, and may deplete an aquarium’s community rather quickly. Most Ontario species eat small invertebrates or fresh vegetation. The eyes of a crayfish are on movable stalks that they manipulate to look around, rather than moving the eyeball (or the retina, like the jumping spider). They have two pairs of antennae, which they use for sensing their environment. They breathe through gills that are located on their frontmost legs (which are also used for manipulating food, and are in front of even their large pinchers); you can see them poking out from under his chin here. After examining our catch and marveling at the size of the big guy, we gently released them back into the water to carry on with what they were doing. Which was probably sitting under a rock waiting for food to float by. Another great article on an old childhood memory! I remember the ones I caught in the Forty-Mile Creek as being paler, especially after two days on the back porch in a covered margarine container. I have to say, though, I found that Wikipedia quotation rather… umm… intriguing. I’ve lived my whole life in Ontario and Quebec, and never known anyone to eat crayfish. My Hamilton-born father regarded any lobsterish creature as an overgrown cricket, and refused to eat it. He loved his mashies, though — had Grandma been pulling the wool over his eyes all those years? Thanks, Lavenderbay. Not sure where that Canada bit came from on the Wikipedia page. It’s possible that in more rural areas of the country (as in, just about everywhere outside southern Ontario) they’re more frequently eaten, or it could be a regional specialty somewhere (say, the Maritimes). It’s something I notice frequently, that the general American culture is to think of Canada on the scale of another state: “Over in Ohio” or “He’s from Kentucky” becomes “Up in Canada” or “He’s from Canada”. So even though Canada’s an expansive place, it frequently all gets lumped in together.